Each week, calls come in from pet parents interested in training their dogs for therapy, emotional support, and service. With such increased interest, it is time to shed some light on the topic of working dogs, how they get there, and how we can help. We also hear from pet parents who have completed a basic training and are wondering “what’s next?” to keep their dog growing and engaged. Our new DOG501 class may be the solution to your questions. First, let’s review: do you know the difference between a service, therapy, and emotional support dog? Significant differences separate them and the services they provide and is briefly outlined below. SERVICE DOGS – Are highly trained to assist their handler in a variety of ways depending upon their specialized training (hearing, sight, diabetic, PTSD, facility). Service dogs are the only dogs granted public access wherever their handler goes under the American Disabilities Act and may be tested and certified for public access at the completion of their training with their matched recipient. THERAPY DOGS – Provide comfort to others in a variety of settings. Some busy airports have started bringing ‘comfort dogs’ through terminals to reduce stress associated with air travel. 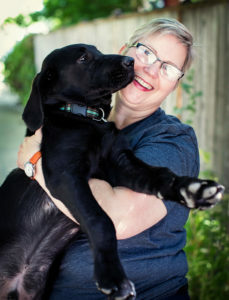 These dogs and their handlers work as teams with Therapy Dog Organizations such as The Alliance of Therapy Dogs and Project Canine in Oregon. These organizations have strict requirements for testing and team training as well as require basic obedience and foundation training to be in place before making contact with them. EMOTIONAL SUPPORT DOGS – Provide emotional comfort to their owners and are not required to have any specialized training. While they can be exempt from no-pet housing and are allowed on airlines, ESAs do not receive special public access and so are not allowed in pet-free restaurants, stores, etc. Dogs have been known to improve our lives both emotionally and physically for thousands of years. They provide emotional comfort, comic relief, and remind us to enjoy the smallest parts of life. Even if you are not interested in having a specialized working dog, as you move through our classes, you may be asking ‘what’s next’ for you and your pup. In our new series called “Spot Goes to Finishing School”, you can continue to foster your relationship with your dog, set and meet more advanced goals (including preparing for therapy or service work), and have fun while we explore the world of Canine Good Citizen and beyond. If you think you’re ready, join us for DOG501: Spot Goes to Finishing School. UPDATE Spring 2018: Carmaleta is now offering a talk on prepping your dog for therapy work! Join us on Saturday, July 21st at 10am to learn more about how to prepare your dog for helping others. REGISTER TODAY!